JAKARTA: In the final moves of Indonesia’s presidential campaign, one candidate dashed to Saudi Arabia to meet its king and perform a minor pilgrimage. The other attended a feline photography exhibition and giggled with delight at a giant photo of his own pet cat. For the world’s most populous Muslim-majority nation, the message intended by President Joko ‘Jokowi’ Widodo’s trip to the birthplace of Islam was obvious after a campaign in which conservative opponents tried to discredit him as insufficiently Islamic. The 2014 election of Widodo, a furniture exporter whose political career started as a small city mayor, was a “manifestation of the new Indonesia, of the land of opportunity in which democratic opening has made it possible for anyone to come up to the top”, said Dewi Fortuna Anwar, a politics expert at the Indonesian Institute of Sciences. Surveys show Widodo with a lead of up to 20 percentage points over Subianto. But the pollsters and commentators are nervous, afraid they might be failing to capture facts on the ground in the same way opinion surveys misjudged the 2016 US presidential election and UK referendum on European Union membership. Election day results that are tighter than Widodo’s narrow 2014 victory over Subianto are quite possible because “the polls haven’t been able to capture the grass roots dynamics,” said Alexander Arifanto, a researcher at the S. Rajaratnam School of International Studies in Singapore. Widodo has tried to neutralise the not-a-real-Muslim whispers with the selection of Ma’ruf Amin, the leading Islamic cleric in Indonesia, as his running mate, though he also risked alienating progressive and moderate supporters. His weekend dash to Saudi Arabia appeared to be one last push to shore up the pious Muslim vote. Widodo and his office tweeted photos of him meeting with King Salman Bin Abdul Aziz, a popular figure in Indonesia, and, dressed in white robes, performing the minor pilgrimage in Makkah. Subianto’s campaign released photos of him at an exhibition of cat photos by a Dutch photographer that featured the politician’s own cat, “Bobby”, which has a following on Instagram. 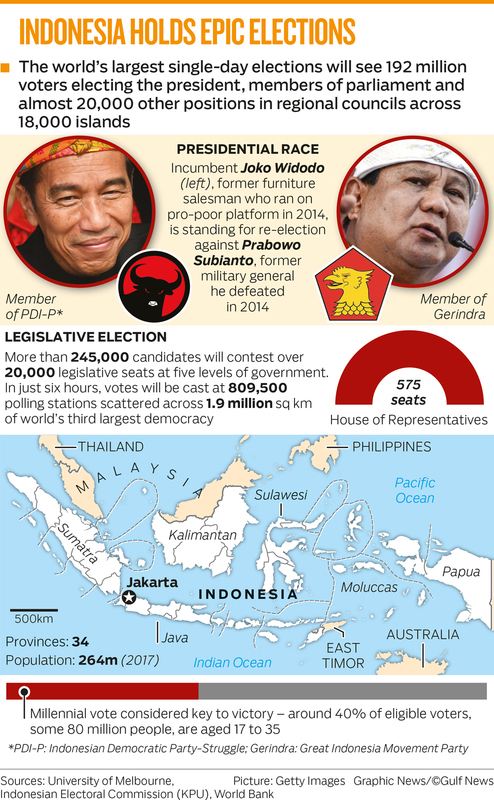 His ultra-nationalist tactics preceded President Donald Trump’s polarising rhetoric by several years and the party he founded in 2008, Gerinda, is officially known as the Greater Indonesia Movement. He has long been dogged by his dismissal from the military in 1998 after soldiers under his command kidnapped student activists, 13 of whom were never seen again. Anwar, the politics expert, said the former general’s campaign is a re-run of 2014, “where he was basically stoking the emotion, the fear that Indonesia was being taken over by foreign interests, the country is basically a basket case, that things are going to get worse unless a firm handler is at the helm”. The UN’s Food and Agriculture Organisation and other international agencies said earlier this month that the percentage of Indonesian children suffering from stunting — malnutrition that can result in lifelong physical and cognitive impairment — fell to 30.8 per cent from nearly 38 per centbetween 2013 and 2018.